Welcome to PetInsurer.com. We know pet insurance is probably not a subject you know a ton about. After all, insurance can be kind of boring and almost always totally confusing. Which leads us to the big question: How are you supposed to know which pet insurance company you should trust your best friend’s health with? Here’s where we come in. PetInsurer.com is a comparison site that compares pet insurance providers side by side. We’ll show you what’s included and what’s not included in over 120 plans. We’ll also let you know the wait times before you can make a claim and crucially, how long it’ll take before you get paid back if you need to make a claim on your pet insurance policy. At Petinsurer.com, we’re pet owners just like you. We know all the important stuff you need to be aware of before you invest in pet insurance for your pet. When you’re looking at pet insurance for your dog or cat, whether they’re two months or twenty years old, you need to compare plans on PetInsurer.com. It costs you nothing, tells you everything you need to know, and gives you the BEST DEAL GUARANTEED. 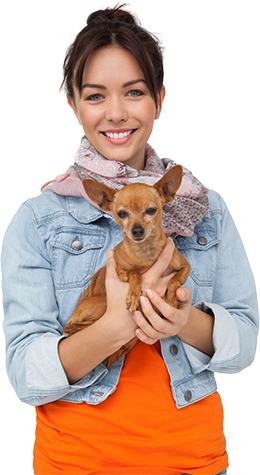 Check what pet owners like you say about our service. I couldn’t believe how easy it was to compare quotes. Getting insurance is usually such a pain, but using Pet Insurer was super simple. All the information came through really quickly, and the site is really user-friendly. I’d recommend to anyone who wants to compare quotes without having to go to multiple sites. I’d recommend Pet Insurer to anyone. It hardly takes any time, you get to make a quick decision and it’s free. Wish there was an app. Pretty good service.I like that it lets me vary details of the policy to see price differences with each set of circumstances. Would be better if they had an app though. It’s definitely worth it. I was looking to get insurance for my five-year-old Boxer and Pet Insurer gave me a range of deals within five minutes of going on their site that I got to customize myself. I picked the best deal based on what suited my dog’s needs and what was in my budget, phoned the insurance company and the whole thing was wrapped up from start to finish within half an hour. I ended up picking a plan through Pets Best and I’m really happy with it. You can tell Pet Insurer is run by peopple who really love pets just like the insurance companies they show you To me that was really impoertant in helping me pick which provider I eventually wanted to go with I like the fact that Pet insurer and the insurance companies want what’s best for your pet It was pretty easy to use and anyone could fill in the form on the website They even create the form online to use your pet’s name Cute!!! Why do they need my contact info before I even buy?? It’s pet insurance – WHY DO THEY NEED MY DATA? It’s annoying that you can’t seem to get anything these days without handing over all your details. That said, they make the buying process easy enough. Pet Insurer saves you time and money. Enough said! A friend told me about Pet Insurer when I had mentioned needing to figure out how to decrese the costs of my vet bills and she said insurance was the way to o. I had no idea there was a comparison site fort pet insurance just like as if I was comparing prices of airline tickets on expedia or something. Really glad she gave me the info because I got a good policy that fits in budget that I could see was the best choice for me of everything that came through. I’d never done online insurance before but found Pet Insurer after googling insurance companies that cater to pets. It’s nice that you can compare everything on the Pet Insurer site but there was questions I had when I clicked to look at more details of each policy so I had wished there was a customer service number to call. I did still end up getting a policy though with ASPCA. Already turned in one claim and everything was exactly as described in the policy details on the Pet Insurer quote page. Really glad to have found both Pet Insurer and ASPCA.I’ll go to Pet Insurer again if I get another dog. Pet Insurer isn’t bad, but the quote page is like information overload a little. I figured they would come up with maybe a handful of quotes, but it was dozens. It got to be alittle too much and I don’t really know if it saved that much time tbh. The Pet Insurer website is really simple, anyone could use it. It finds you the best deals within minutes. Can’t get one qupte for multiple pets. My girlfriend and I’ve got four cats and thought it would be easy to get quotes for all of them at once but the site wont let you do that! You have to fill out one form for each pet which is not what I wanted to do. Bu that time I feel like I ended up taking mre time in the end. Getting insurance through petinsurer.com was so easy. It took me less than half an hour from start to finish and I didn’t even have to talk to anyone on the phone. I like how you can filter the searches so that the policies you’re shown only include the features you want and then you can tailor it to your budget on top of that. It’s really refreshing to be able to see all the deals from lots of different companies in one place – that way you can compare them yourself and go for the one that works best for you. It really gave me peace of mind to know that I had in fact picked the best coverage because I could see everything else for myself to make that determination. I ended up saving $16 a month by switching to a Nationwide policy I found through Pet Insurer. Really great service! You won’t be disappointed. I couldn’t believe how easy it was to get a deal through Pet Insurer. The formtook no time at all and you don’t need all the tiny details that most places make you enter in order to get a quote, just some basic facts about your pet. The results come back in less than a minute and they even send you a text and email of your quote info at the same time so you have the information saved if you need to come back to it. I really liked that and could tell they had put thought into what would make things easiest for the purchaser/pet owner. Good, but can’t enter multiple pets info. I’ve got two dogs and wanted to get them quoted for insurance at the same time. You can’t do that through Pet Insurer so I had to do them both separately. It didn’t take that long and it was still pretty easy, but it would be handy to be able to insure more than one pet at once. Pet Insurer really does make the process of buying insurance simple and stress-free (who kew that was possible.) I like that I can see all the possible policies side by side just like when buying flights off priceline. They also help you consider policy option beyond the norm that you might not even realize are importnt, like coverage for your pet when travelling. That was a big plus to me because I have to move every few years for my job and now I don’t hav to worry about the policy not transferring or my pet not being covered by a different vet should an emergency happen. Pet Insurer has put everything out there for you—really awesome. Ready To Invest In Pet Insurance? With Pet Insurer, I know my pets are protected no matter what happens.